This is not a real Grey Knight dreadnought model. And by real, I mean from Forge World. It might have been at one point many, many moons ago, but this guy is a later generation casting for sure. I'd bet money on it. I've worked with a number of Forge World models and this one sent to me by my friend that he picked up off eBay doesn't even come close. And it (the resin) smells funny when you cut into it during cleaning mold lines and such. Creepy. The list of issues was quite interesting to say the least. The model was sent to me just as my friend got it. He realized he could not make this thing go together and he sent the whole bag of problems directly to me... express mail. To start, we were missing pieces. After that, I quickly realized the legs were not going to attach to the torso as they arrived no matter how hard I tried. The engine was another issue. It wasn't going to attach as it was either. Then I discovered the arm pegs were not round, but more oval shaped. They also stuck out at an angle and not straight out from the body. I suppose that's okay because the left arm did not have a hole for the peg to stick into anyway. And the whole thing had a certain softness to it that you get after making a mold of something and casting it over and over. If you've ever cast something, you know what I mean... you lose a tiny bit of the sharpness in the casting process and eventually it shows up on the model. So how did I fix this thing? I did my best with what I had. It took buying some new parts and casting some other pieces to get this guy ready for the table. I put him on my absolute, hands down favorite base of all time. The Urban Rubble line from Secret Weapon minis. I only had one of these 60mm ones lying around and I decided to give it to my friend for this model. I'm a big fan of the whole destroyed city look and there's something about these that I really like. Don't get me wrong, lots of folks make some great "urban rubble" bases, but these stand out to me more than the rest. I figured this guy needed all the help he could get if he was going to make it to the tabletop. The only downside to using this style base is that the model must be pinned to it. The surface detail is tremendous and to get your model to stay on there, he's got to be pinned. Pinning wasn't an issue though, I drilled though the lower portion of his legs, through his feet and into the base for both feet. That combined with the pin at his hips means he should hold up to regular game use without any worries. Since the legs were not going to attach as they came. I had to rebuild his hips. I figured I could take and cut the small piece off the legs and replace it with a much larger hip section from a regular dreadnought. I took a set of dreadnought legs I had (half of them) and made a simple one press mold of the top hip section using BluStuff. This allowed me to cast half of the new, wider hip piece. I was able to cast two halves, trim them up, glue them together and attach them to the legs. The new hip section came in at the perfect height too so the guy doesn't look odd. The engine was an easy fix. I bought a new one for a regular dreadnought and with some careful trimming, it fit right into place without any further problems other than the back of the dreadnought torso being slightly angled and not perfectly square. In the end, I think I did a pretty good job of saving this guy and getting him built. I guess the moral of the story is to be careful when buying models and bits from places online. If you aren't getting them from the original location (like Forge World), then you run the risk (however slim it may be) of getting counterfeit bits. Not all bits providers out there are doing stuff like this, but they are out there. Just be careful and you can avoid the surprise and the work that comes with a counterfeit model like this. Wow, that's a lot of work! It's a shame your friend got a knock-off from the looks of things. Still, he turned to the right person to make the best of a bad situation. The fixes you rolled out are pretty spot on and seem to be doing the trick. Nicely done! Great article, Ron. I know exactly where that model came from as I got gifted one of those by somebody who tried to buy "cheap FW models" from China. AT least I know how to make it go together now. The resin is weird too. I hope I don't get cancer from handling this junk some day! Great work on that miniature, and thank´s for showing us. I also have had an experience with the same kind of stuff and long story short, I lost intrest in the miniature and now it´s still in pieces somewhere. 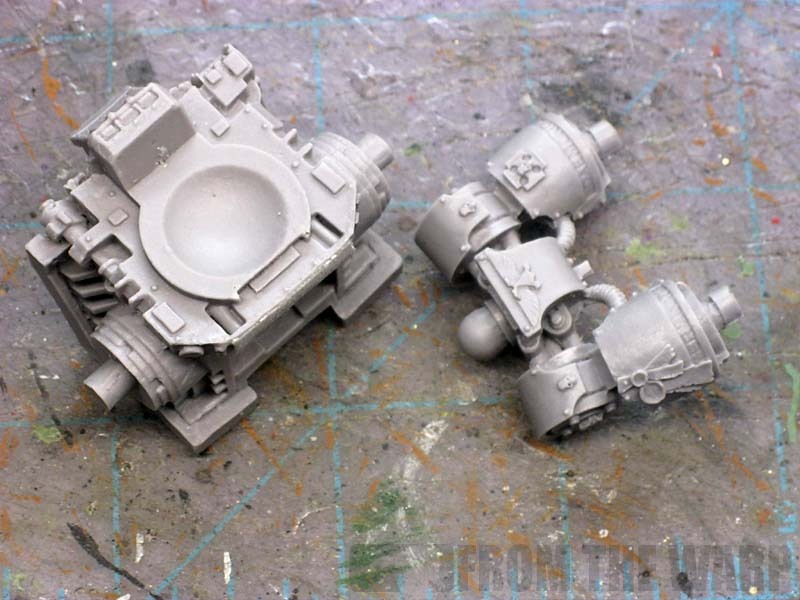 I had very similar problems with a real GK Forge World Dreadnought, on the engine side and with the arm pegs. Sometimes cast is just too bad. I was gifted the same Dread torso. When cleaning it did it smell like a fat black magic marker? Thats what i thought it smelled like atleast. I am having to cast some Cyclone missile launchers for my DeathWing force, as no matter how i try, finding them on bits sites etc is impossible. So i bought an old metal termie with cyclone launcher from ebay, i got some RTV silicone and resin and will make 2 copies to use in my force. 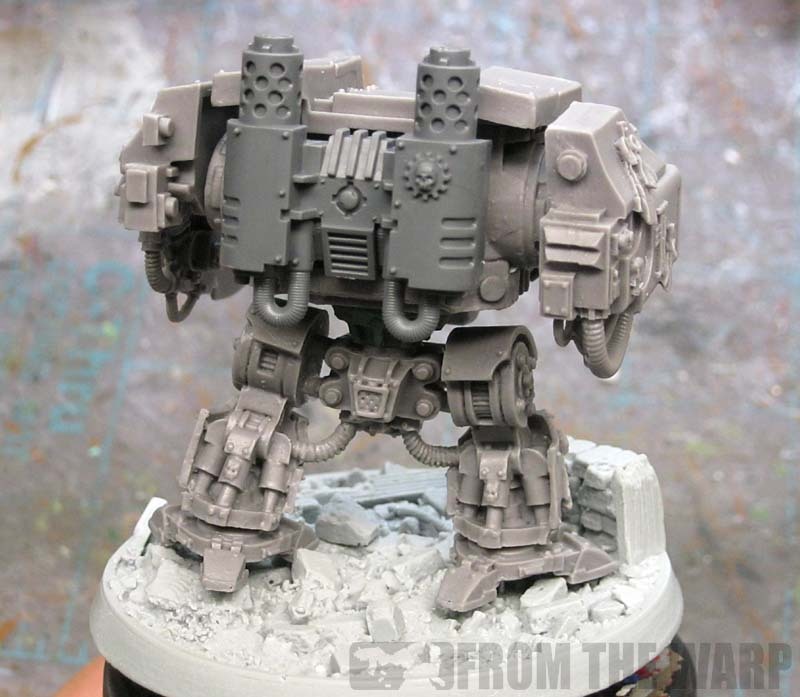 I am a bit hesitant as i know GW is really big on clamping down on IP infringements, but i am not buying 3 boxes of £28 terminators for 3 small bits! If its an issue, i can remove them and chuck them in bin after tournament. Great work. That is a really interesting kit and definitely contains pieces from several different FW kits. The GK Torso it came with was originally released by FW as an upgrade component for the Plastic Dreadnought (which is why the plastic exhaust system fit so well) about the time the Original Ordo Malleus codex was released. It was never designed to work with the Complete FW dreadnought kits. I had a few back in the day to support my Metal GK army. Not sure it's counterfeit. 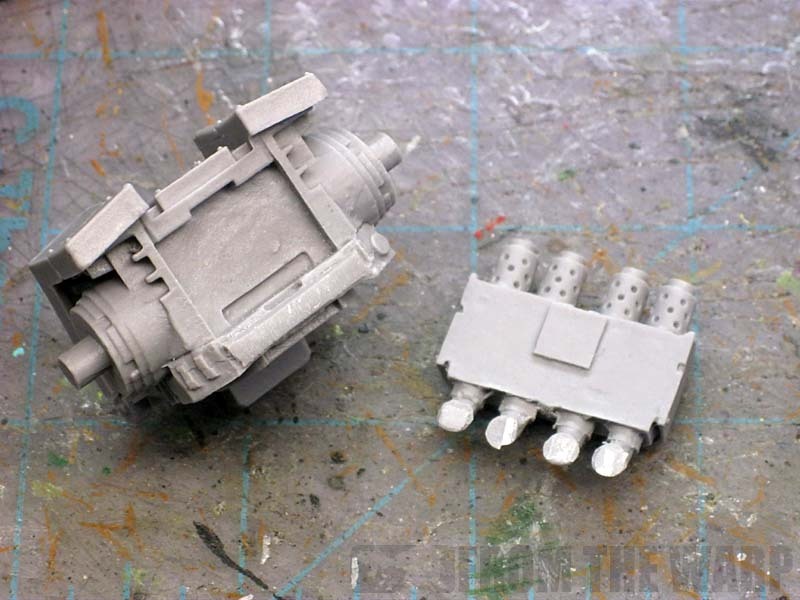 This torso is the one sold separatly by FW to fit on a plastic Dreadnought. Your fix make it nicely. Good job ! Great work on the Deady. But I think you need to name and shame its supplier - to save us all the hassle of sending you our counterfeit items :). Funny thing is Ron, my last few Forgeworld kits were a bit soft and parts were missing. The "cheap Chinese knockoffs" I've, uhm, seen, didn't have those problems. @Old School Termi: the chinese guy's resin is a different colour and is harder than the FW stuff, that's not it, not by a long shot. Huron and Anon are correct, those are separate pieces from different kits. It's not really that pieces are missing, they're just two different versions packaged together. And for the record, I've NEVER gotten properly round arm pegs or arm peg holes from FW, they've all been oval and mis-aligned. Excellent work. What an interesting collection of parts to buy on ebay. Recasts are becoming something of an epidemic on eBay. The last three OOP minis I got there were recasts, some better than others. The sellers were completely ignorant of the fact and had a good track record of selling legit items, so these were mostly acquired through trade. Nice work on the retrofit. Yeah I don't want to condone chinese product or anything but that isn't from the guy we're all thinking. That stuff is more yellow, is hard and I've yet to see anything missing or not crisp. It does smell like cancer though when you drill it for flash removal or pinning. I think you run this risk on anything OOP or resin though as it's a pretty easy money maker out of Russia and China. If people are concerned they just shouldn't look for deals on ebay and buy direct otherwise they'll be taking this risk. If you don't care, use ebay. The misfit is an issue FW used to have (I bought a LOT of FW stuff before they outsourced their production). 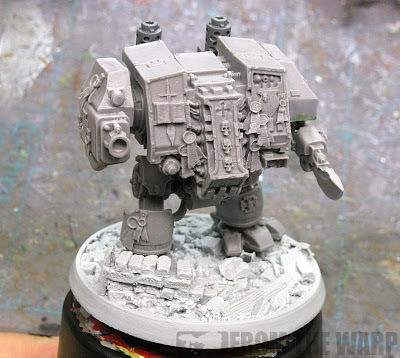 Odds are, the dudes your buddy bought this dreadnought from copied one of the older casts before they fixed the problems. The softness is definitely from having a model reproduced too many times and not taking care of the mold. 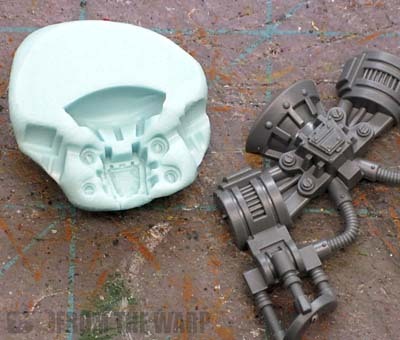 Hobby molds are not for production. Resin quality also varies significantly, even from FW. I do tons of casting, and even something as silly as failing to shake one part of the A-B mixture can cause a rubber-like resin cast that can't be used. Sometimes the discount on price is worth the drop in quality, that's for each buyer to decide themselves. What you're planning on doing doesn't violate any copyright laws, seeing as you're not profiting from the reproduction of copyrighted parts. It's similar to videotaping a football game for your own enjoyment. Bottom line is: if you're not selling copies, cast away! Krisken: Thanks. Ultimately, it did not take much, but it can be a paint for someone not expecting the additional work. Old School Terminator: I'm no resin expert, but FW stuff generally doesn't smell... this stuff did and bad! Denniz: And that's the sad part. You might have thought you were getting one thing and ended up with something completely different. Sorry to hear it's been scrapped. Gaspard: I can understand some issues with resin, But this guy was all of those and more. I could be completely wrong, but if I were a betting man, I'd put my money on it not being official. And either way, it still creates a tremendous amount of work for the buyer when these kinds of issues come up even though they shouldn't. Anon: It smelled more like the old school tube of Testors plastic model glue that was super stringy and melted plastic together. Richard Rose: The issue of casting bits for your own use is one thing, selling them as actual GW or FW bits to others is another thing all together. I don't think making a couple cyclone missile launchers for you own army is the end of the world. Making them by the dozens and selling them online and telling people they are actual GW bits is another thing. HuronBH and Anon: Interesting... I believe this one was pawned off as a whole model though or the impression was that it was a complete kit with no additional work required. Isiah: I think just putting this out there for folks to be aware of is enough fr me. I don't have the resources to become an online bits watchdog unfortunately. Faolan (Jake): Now my FW experiences have been different. The parts were fairly crisp, nothing missing and when it came to dreads, the arms and such lined up nicely on round pegs. Feldmarshal Goehring: And that might have been okay for my friend if he knew he was getting a collection of bits and not a ready-to-build dreadnought. Mike Howell: Interesting. And that might very well be the case here. I don't know the vendor or exactly how the model was described in its auction. TheAmbit: And that's the biggest point. It is a risk when buying online unless you know the seller or company. It's something folks need to be aware of and getting models like this can result in some additional work on an occasion if you're not careful. Myles: Maybe that's the case. I don't think he was expecting to get the amount of work that came with the model. That's the biggest disappointment out of this. Maybe he got a good deal, maybe not. He ended up needing to do a whole lot more to his model though just so he could put it in his army in the end. Something everyone needs to consider. uh oh... I just ordered a FW piece out of Russia. Wonder If I'll get a knock-off. I guess it won't be a big deal, I just ordered a new weapon arm for Bjorn, and plan a fair bit of additional work for it, anyway. At least I didn't go all out and buy the Death Korp squads I was planning to get. Anywho, good job on the refit, Ron! Hey Ron, you ever worked with Milliput? For as large a piece as you cast there, it might be a better alternative. Lets just put it this way.If you are buying ForgeWorld on ebay and the price in dollars is what it usually costs pounds and the seller also has about a half dozen to a dozen other high demand FW items. And the seller is Russia or China then it is probally a knockoff. They are not bad if you stay away from the stuff that has alot of detail. Brandon Griffith: it's just a matter of being aware and being a smart shopper when it comes to buying certain things. JW: I have... I'm just starting to get into using it these days. Will: Good point, if it looks to good to be true, then it probably is. 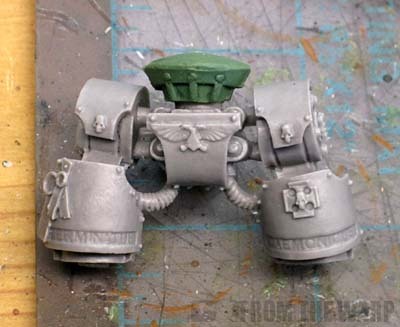 Counterfeit Forgeworld items seems as if they are becoming more widespread on eBay. I bought two sets of MkIV Space Marine armor (at not that large of a discount I might add) from two different over seas sellers, one from Germany and the other from Taiwan iirc, and neither were actual Forge World models. If it's on eBay and it's Forgeworld look closely at the pics and the sellers other auctions. I wish I had. It seems like a good queue that it's actually a first casting from FW the auction will have the Forgeworld bag and tags in the auction listing pictures. Brainwashed: Good point, they might be. As people are able to improve their skills and the equipment to make wholesale copies of models becomes more available, I'm sure these kinds of things will happen more. It comes down to being a smart shopper and understanding the risks you take when ordering outside of a company. @Ron: Try blending it with greenstuff sometime. It takes a little work to mix them, but the resulting material is incredibly versatile. JW: That's exactly what I've done and I love the results. Once I get my studio back up and running, I plan on diving into that aspect more. Incredibly versatile is a good way of explaining it. I've got one of these. I raised hell when I got it, and ended up getting it for about $10 shipped from Hong Kong. chuck: I hope your's came with all the parts needed to get it on the table. This one needed some real work to get it together.